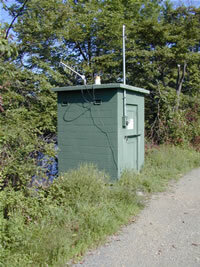 LOCATION.--Lat 40`45'25", long 75`36'12", Northampton County, Hydrologic Unit 02040106, on left bank 0.3 mi upstream from highway bridge at Walnutport, and 0.4 mi upstream from Trout Creek. PERIOD OF RECORD.--October 1946 to current year. GAGE.--Water-stage recorder, crest-stage gage, and heated tipping bucket precipitation gage. Datum of gage is 350.27 ft above National Geodetic Vertical Datum of 1929. Satellite and landline telemety at station. REMARKS.--Flow regulated by Wild Creek Reservoir, Penn Forest Reservoir, Francis E. Walter Reservoir, and Beltzville Lake.